The City of Kitchener is looking for community feedback before adding two-way bike lanes on one-way streets. 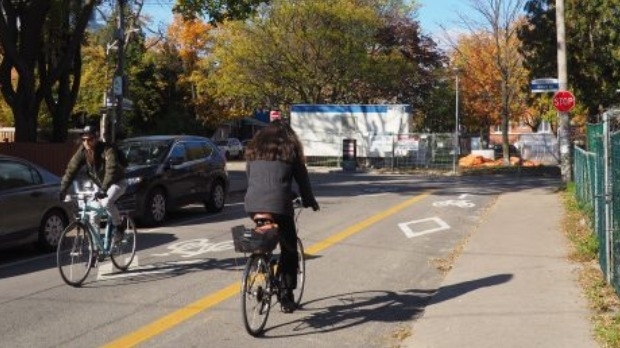 “The advantage of a contraflow bike lane on Young Street specifically is that it would allow a safer crossing at a light to get across Weber Street, including a bike sensor and signal that would have a dedicated phase for the bike going in the opposite direction of motor vehicles,” explains Darren Kropf with the City of Kitchener. Both streets include a one-way stretch. With the new lanes, cyclists would be allowed to go both directions, but it would mean a loss of some parking spots in both areas. This style of bike lane is already employed effectively in other cities like Toronto. The city hopes the lanes will provide a safer, more convenient route for cyclists in the downtown core. Residents will be able to chime in at a public meeting later this month.